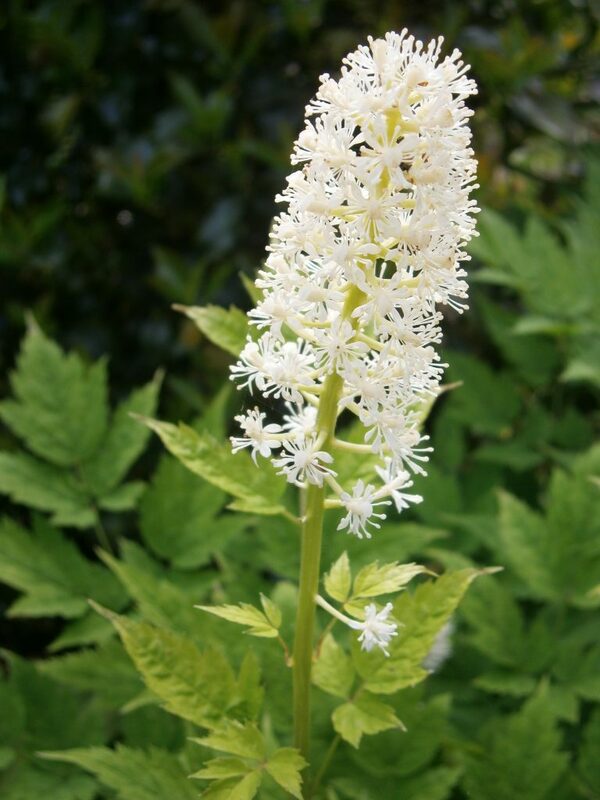 Actaea alba is a perennial herb, 40-80 cm tall, erect, plant poisonous, roots associated with VA mycorrhizas (Brundrett and Kendrick 1988). Leaves alternate, blade 2-3 times compound, leaflets egg-shaped, toothed, emerging with flowering stalk; blooming May-July. Actaea alba (doll’s eyes; Ranunculaceae) inflorescence. lookfordiagnosis.com (Accessed 7/2017). Flowers white, small, radially symmetrical, petals to 0.4 cm long, spatula-shaped, stigma broad, no style; inflorescence an unbranched terminal cluster (raceme); blooms May-June. Fruit fleshy, white berries, 1 cm long, with dark spot at tip (persistent stigma), fruiting stalks red, stout about 0.2 cm long from the central axis, 1-seeded; fruits July-Sept (Hough 1983). fruit eaten by mice and some game birds (Martin et al.1951). Habitat: Moist to dry, undisturbed forest understories in rich soil.